Sheepsfoot roller. 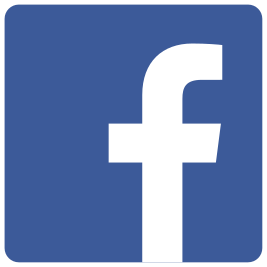 Dirt was first compacted by the hooves of a herd of sheep or other stock. 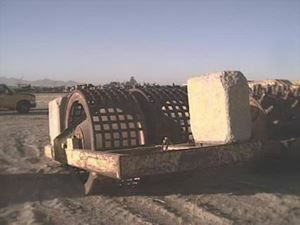 Pulled by a tractor, the sheepsfoot roller uses spikes on a drum to imitate the action of hooves. 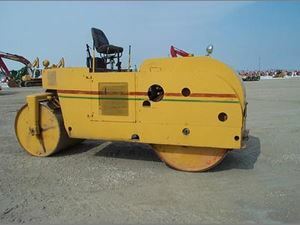 Tri-Tandem roller: Galion TC14-20G. 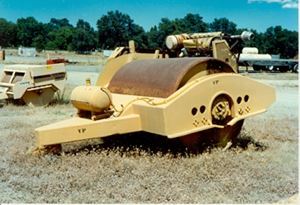 A tandem roller with a third drum, this 20-ton machine was used to compact asphalt pavement from the 1940s until the late 1960s. 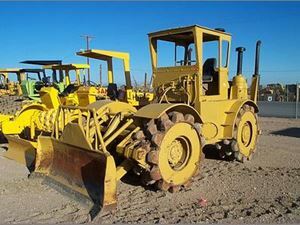 Towed pneumatic roller: 1954 Bros R67. 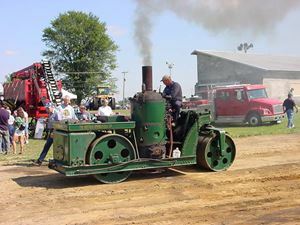 Pulled behind a wheel tractor, the roller’s two rows of tires knead the surface without crushing it. 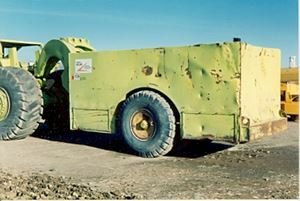 A hopper between the axles carries ballast for weight. Proofroller: Bros 450. 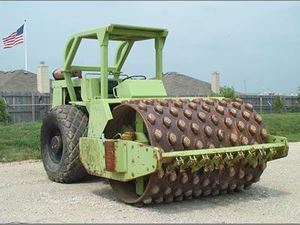 Four oversize tires and a ballasted weight of 50 to 100 tons provide deep compaction of earth fill. They are still used, although production apparently ended in the 1970s. 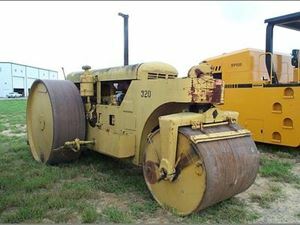 Pneumatic roller: 1964 Ferguson 2511. 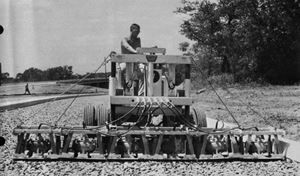 Self-propelled pneumatic rollers came out in the early 1950s, and have been ballasted from 9 to 35 tons. 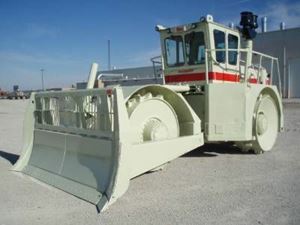 Today, they are used mostly to compact asphalt pavement. 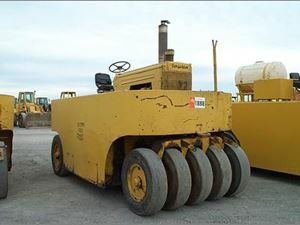 “Skirted” pneumatic roller: 1968 Bros SP10000. 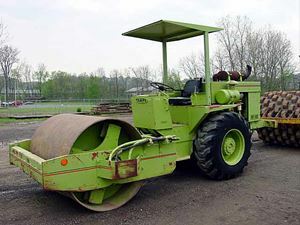 Some pneumatic rollers are equipped with heat retention shields, or “skirts,” to trap the heat of asphalt pavement as it works. Static compactor: FWD Wagner SF430. 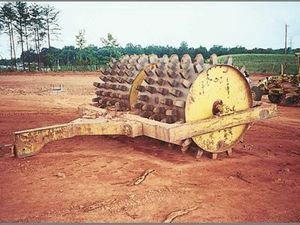 Combining the work of a bulldozer and sheepsfoot roller into one machine, these rollers spread earth and rock fill, and compact it by dead weight. 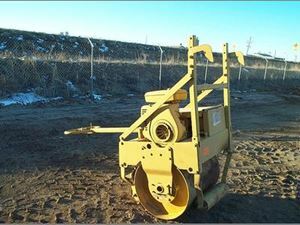 Towed vibratory roller: 1965 Bros VP20D. 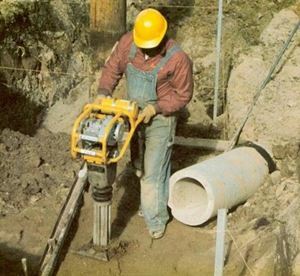 A vibratory roller’s drum contains a whirling eccentric that causes the drum to vibrate, amplifying its compacting force. 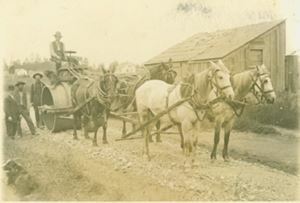 This one is pulled by a tractor. 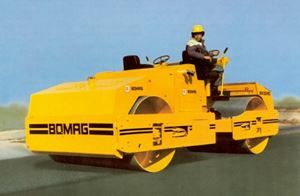 Tandem vibratory roller: c. 1980 Bomag BW220AD. 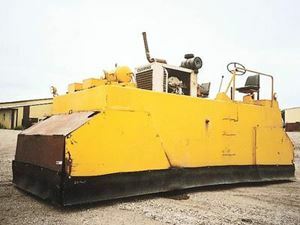 This roller uses two full-width smooth drums to compact asphalt pavement. Unlike the tandem roller’s dead weight, both drums vibrate to increase force. Walk-behind vibratory roller: 1975 Essick VR30W. 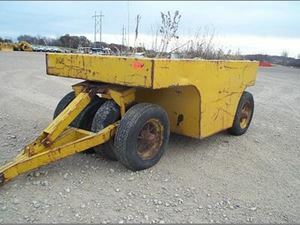 Designed for work in confined areas, this roller hooks to the back of a dump truck. Other walk-behind rollers compact backfill in trenches.